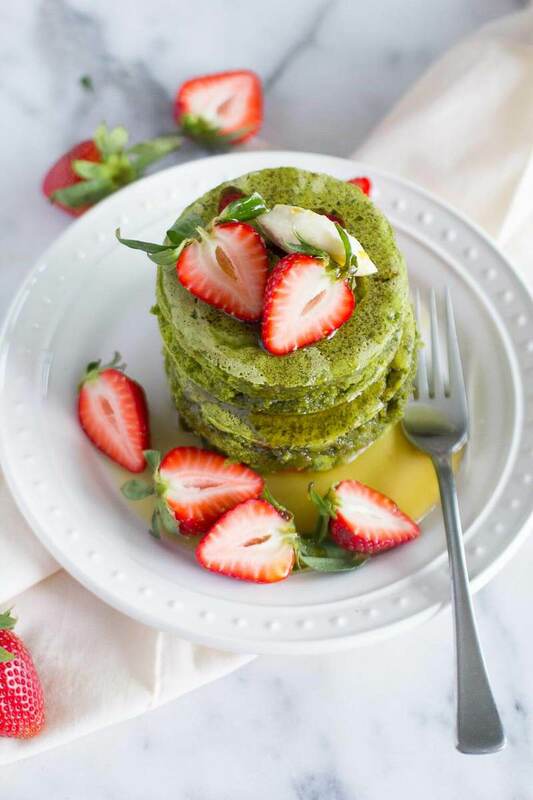 Just in time for Saint Patty’s Day, here’s a green treat to make your family for breakfast or brunch! 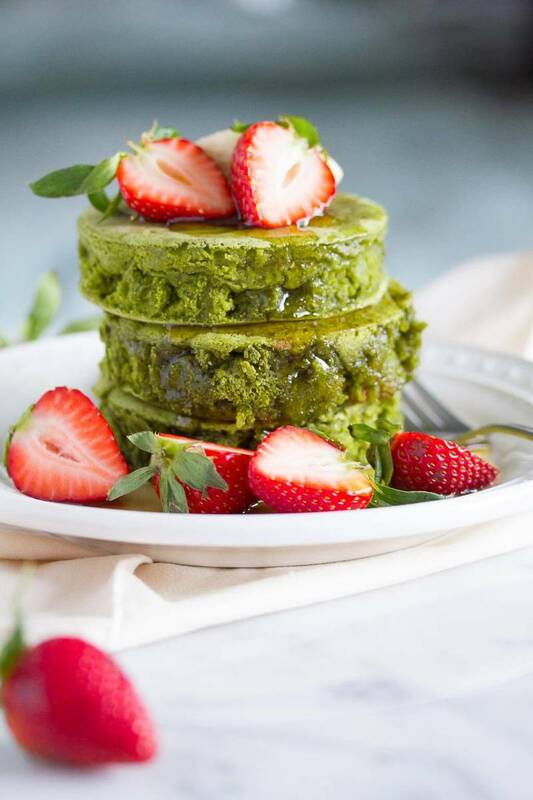 Matcha vegan and gluten free pancakes. This recipe is amazingly light and fluffy, and not too sweet! In fact, the only only sweetener is from the maple added on top! Feel free to use any fruit you like-I have used blueberries, strawberries and raspberries all to great effect! For the wet mix, in a bowl mix the ground flax and the warm water and allow to sit for 10 minutes. Add the almond milk, vanilla extract, apple cider vinegar and olive oil and stir well. Set aside until ready to add to the dry mix. For the dry mix, add the flour, baking powder, baking soda, salt and matcha to a bowl and whisk till well mixed. Add the wet mix and stir until most of the lumps are gone. Be careful not to overstir! To cook the pancakes, heat a skillet over medium heat and add a small amount of oil to the pan. 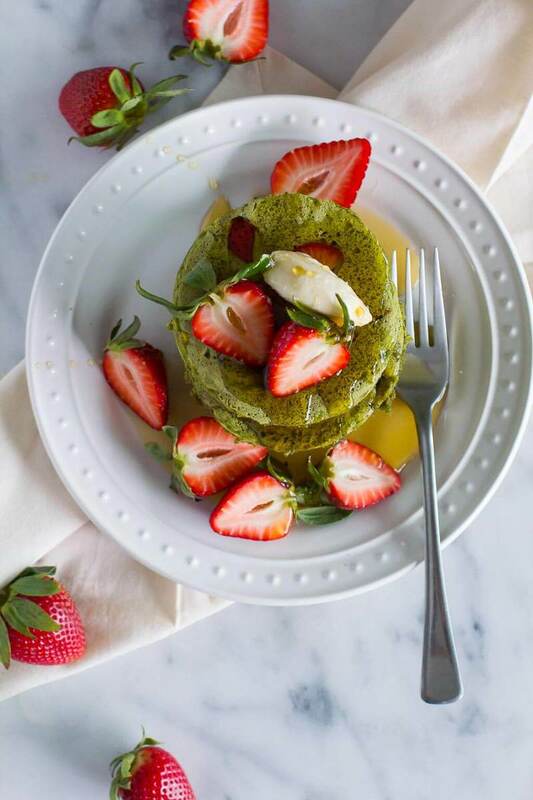 Ladle out a 3 oz portion of the pancake batter into the pan. Sprinkle some of the fresh fruit around the top of the pancake. Cook until the pancake is bubbling around the edges and then flip (after about 4 minutes). Cook on the other side about 4-5 minutes or until cooked all the way through. To serve, top with more berries, maple syrup and vegan butter!